It was long long ago, when John Milton’s Satan stopped somewhere driven by his wandering thoughts which paused him for more than a few minutes, forgetting his basic plan to spread hate and not love; for all that pleasure to destroy had evaporated during those moments of redemption. Then had that Renaissance love for beauty found its place in more than just those humans. There is that possiblity that this might have happened at Aleppey, not too far away from Cochin. He was no tourist; but Alleppey is a favourite destination for the visitors and may be he was also a guest to that world created in the world which was not meant for him, as if it belonged to him as a level of inheritance fro his creator and also his brethren in heaven who didn’t fall with him. May be there is a little of him and his essence in every serpent which stands still and wonder at beauty of nature or random damsel; delighted may be them too; the hot flames of eternal hell can blame in them better, sometimes hidden and sometimes known to the world, even if the creatures never come to know about it. The picturesque water bodies including all thosecanals, backwaters, beaches, and lagoons should have been even better than the imagination of someone who lost all the joys of heaven in a flash. Even for the biggest foe of man, created and living from its most destructive element, it was not able to create that much needed aversion and hatred which would have made his alignment perfectly clear. But he was to stay between the cosmos and chaos, even if closer to the latter and struggling to stay there. There was no fate’s intervention in it, as it was as clear as the water of the spirit world and as pure as the fire which burnt them; unless some third generation demon was to get into it. There was always the grey portion between black and white, good and evil, but in that journey towards pure evil, the slide was surely towards the evil side except for those few moments of petrification, not induced by that gorgon which had himself in multitude on her head, but by that sense of beauty which didn’t leave him even as all his good qualities deserted him one by one. Fate had no reason to be there, as it was individuality and free will which ruled that former angel; not to be controlled by anything other than his own brainy mind which excelled enough to question more and more beyond that horizon which formed that wall held by pillars of faith, belief and obedience. The first thing to do in Alleppey might be to look for that houseboat; one of those boats for having a great journey around the backwaters of the Eastern Venice. But forgetting Mount Carmel Cathedral, a fine white building, would be going back to the man of Milton with all the internal vices. The question would be, where to fit the churches of Arthunkal, Champakulam and Edathua. Considering how old and beautiful in the Keralite style the Champakulam church or the Saint Marys Forane Church is, Saint George Church at Edathua church looks beautiful to the tourists as well as the pilgrims, thus making it that spiritual destination beside the element of water. There is nothing much left to be said about Saint Andrews Basilica at Arthunkal, known more for Saint Sebastian than the saint whose name is bestowed upon the church. These three churches could make the situation difficult for Milton’s hero, along with the cathedral; but as it is known for centuries, evil always finds a way; so did Satan in the Garden of Eden and so did all those evil thoughts which haunts men so hard as if it came out of Pandora’s Box in a hurry and wants to go back to its ancestral home in the other dimension. The holy presence made by Arthunkal, Champakulam and Edathua would have its existance, but as long as the materialistic and more romantic view of the world is concerned, it is to be traced back to the house boat or that boat which is a house on water; my definition would be “that thing which stays over water and pretends that it is a house”. 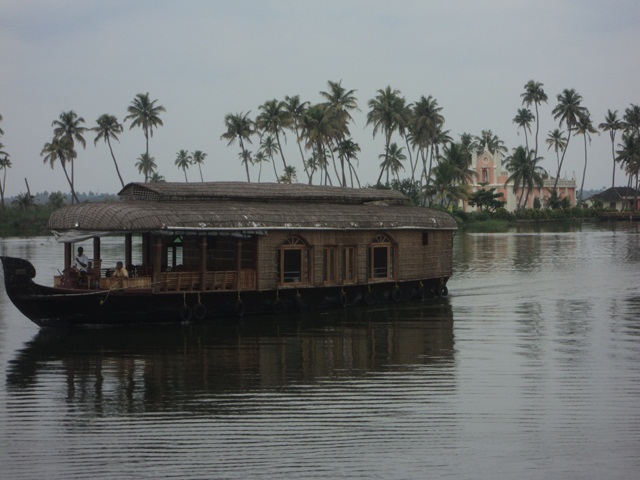 It is motorized and it is to be referred to as a kettuvallam rather than a floating house. These things with thatched roof covers on the top and wooden hulls below it, are as photogenic as the surroundings which struggle hard not to pale in comparison. There is that positive competition which is a joy for the viewer; a tourist, a poet, an artist, a photographer or even a random person who fell into water and is going to die drinking what is around that landscape. When “kettu” means “to tie” and “vallam” means boat, it gets that name it is commonly referred to, and it is that symbol of Kerala tourism which strikes that arrow into the heart of a tourist as if Ares had taken that weapon from Cupid and is shooting them with so much power as to hurt the longing hearts of those people who are too far away or are having a life which is too busy. When Kerala was placed among the fifty destinations of a lifetime by National Geographic Traveler, the role of these houseboats were not be seen lightly, and now there are so many of them; in different sizes and with that needed variety in the looks and style. Aleppey is that fort of houseboats; a powerful stronghold which could take more crusading army than the Eastern Roman Empire, Edessa, Antioch, Jerusalem and Tripoli could ever contain; not as a war for territory, but as a battle of imaginations which would strike faster than the swords of those mighty warriors from Europe. The swords of imaginations would clash with the shields of fancy which would create that unparallel effect; not of blood, not of gore, but of eternal beauty of nature for which even the most powerful warriors would lay down their weapons; even Montezuma would come all the way with his Eagle Warriors of Tenochtitlan and his prized Jaguar Warriors in a canoe, just to surrender to this beauty which, could have had a parallel at his place, but was denied to him by Hernan Cortes and his Spanish Conquistadors. The beauty of Aleppey is not something to be avoided, not even for the souls of the people with the most inglorious insides which would make Satan inferior in infamy. What happens in Kumarakom and Aleppey might just be the same; a journey through the beautiful backwaters supported by that greenery which surrounds the lake better than Milton’s man surrounded humans with sin, but in a good way. When you go there with friends, you eat food, you take photos until your camera calls you names, think about the poems of Wordsworth, Shelley, Keats, Coleridge, Byron or whoever comes to the mind; be that lotos eater Lord Tennyson had mentioned, or be his Ulysses; your choice, your path on any side of that mending wall of Robert Frost. There web of beauty which nature has stitched for you; it is that local Lake District you had been waiting for; who knows what is to happen to Romanticism with that overdose; for there is always the probability of dead authors living their dreams in the minds of upcoming writers, who wander aimlessly like a houseboat or in a houseboat through that deadly imagination combination which rules this part of the big world.